At the west end of the promenade, the Gold Star Table recognizes the supreme sacrifice of our Gold Star Families. 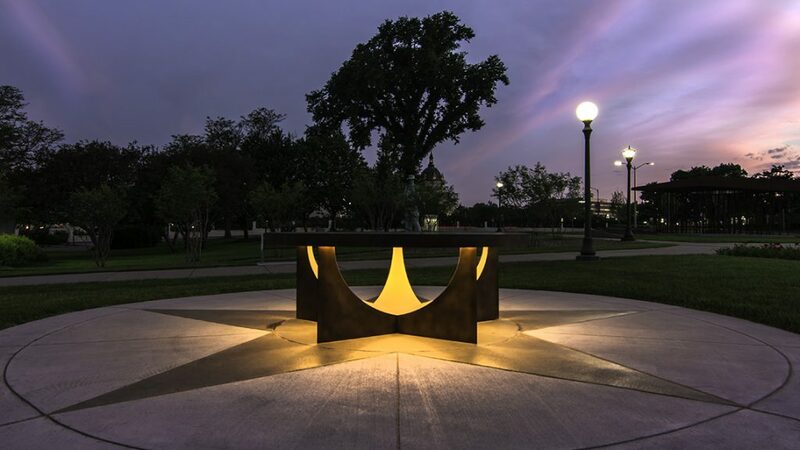 The space features a sculpted table representing many narratives. It recalls the tables that we gather at as a family to share dinner, stories and laughter. It is a place of gathering, reflection and recreating memories. In the home of a Gold Star Family, loved ones are daily reminded of their deep loss when they see an empty chair at their dinner table. The table in this Tribute has an element of transcendence however, suggesting that one day these families will be reunited. Made of enduring bronze, its five-pointed foundation resembles the gold star. Northern hemisphere constellations shine through the table’s surface, allowing light to pass through and creating a guide to the night sky. Polaris, the North Star is emphasized, a constant navigational guide home, and refers to our State’s motto L’Étoile du Nord, The Star of the North. To older civilizations, the stars were used to map their way home. Visitors can come to the table to express gratitude for Gold Star Families through thought, word or deed.